The TV show “Moonlighting” starring Cybill Shepherd and Bruce Willis premiered on ABC, kicking off with a two-hour TV movie. Touted as a comedy/mystery/romance series, “Moonlighting” revolved around the Blue Moon Detective Agency and its cases investigated by partners, Madeline “Maddie” Hayes (Cybill Shepherd) and David Addison (Bruce Willis). The show was fueled by a mix of quick dialogue, sexual tension and mystery; it brought the world Bruce Willis and reintroduced us to the brilliant and talented Cybill Shepherd who had been missing from the spot light for almost a decade. The story begins with Maddie Hayes, a former model whose reversal of fortune starts with her accountant embezzling all of her money causing her to go bankrupt and to face failure of several businesses she used as tax write-offs, one of which is the L.A. Detective Agency. David Addison, who heads the agency, persuades Maddie to keep the business and run it as a partnership. The pair renamed the agency “Blue Moon Investigations” as homage to the days when Maddie Hayes was the famous spokesmodel for Blue Moon Shampoo. “Moonlighting” also starred Allyce Beasley as the firm’s quirky receptionist Agnes DiPesto, who took a fancy to answering the phone with rhymes Dr. Seuss style. A few seasons in, Curtis Armstrong (best known as Booger in the Revenge of the Nerds movies) joined the show as Herbert Viola, a temp turned investigator and Agnes’s love interest. The show’s “jump the shark” moment was at the end of season three when the finale had Maddie Hayes and David Addison finally hooking up. Eventually, real life conflicts between the stars and their separate interests in other projects, as well as various other factors, brought on the show’s demise. 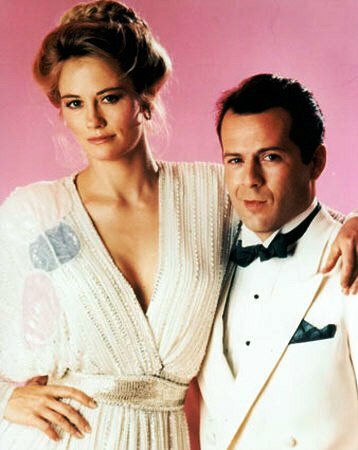 In May 1989, “Moonlighting” was canceled. previous post: Rihanna And Chris Brown Are Back Together! WTF? ?